Wader Quest: Nordmann's Greenshank. New wader species for east coast Peninsula Malaysia? Nordmann's Greenshank. New wader species for east coast Peninsula Malaysia? Nordmann's Greenshank (left) and Grey Plovers, Mersing estuary, Malaysia. After a few hours’ sleep and then some work I ventured out on to the estuary. The high tide is at night at present and so I didn't hold out much hope but did decide to give the run up of the tide a go... The tides are quite high at present and with the combined strong on-shore winds and rough sea-state the tide comes in very quickly. The push up was good but very fast and much sooner than I had expected the mud was covered and the birds had moved on. I decided to check the northern beach and as I searched to find where the flocks of waders were roosting I could see that most of the birds were half way along. As soon as I began scanning I was stunned to see 6 Black Headed Gulls, this is the first species of Gull for me at the site and in-fact the whole of Peninsular Malaysia. I couldn't believe it and it turns out that 6 is probably the highest ever count of this species in Peninsular Malaysia. Then just as I continued scanning I decided to count the Grey Plover flock and then "Boom" out of no-where was the Nordmann’s Greenshank. I had always hoped for a Nordshank here at Mersing but after so long of looking and drawing blank after blank I had actually given up and put it down to the fact that the site wasn't right for them. I came round to the idea that maybe the substrate was to sandy for them and not as muddy as other estuary areas I have previously seen them in. After a few minutes I settled in and just watched the bird as it was being pushed up by the incoming tide. I moved closer taking [some photos] and just settled in to watch this bird; but a local walker put pay to that and the flock flushed and that was the end of the Nordshank and the larger waders. This record constitutes toe first record for Mersing and also the state of Johor and possibly the east coast of peninsula Malaysia. As you can imagine I was really pleased with this bird and had only wished I had been able to spend longer enjoying it and the moment. Even so it was a nice "welcome back gift"
When you look at our photo of Nordmann's Greenshank it makes you appreciate what a great shot Simon got of his! Spot the Nordmann's! There's a small clue in the photo! 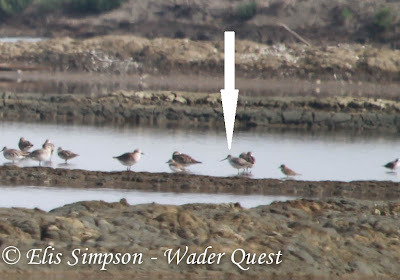 Simon runs a blog site called Wader World 2013. 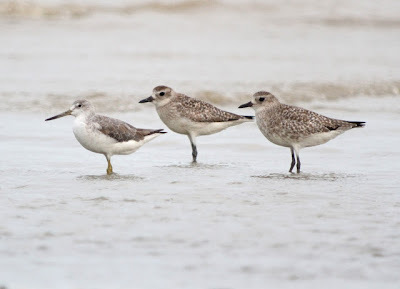 He keeps a regular blog running about the comings and goings of the local waders where he lives in peninsula Malaysia, he finds some pretty stunning birds too as you can see from this report. But the site is more than just a blog, it is full of useful and interesting infoprmation, pages about colour ringed birds and their history, others about the fight to save the Spoon-billed Sandpiper. He has a superb library of stunning photos of waders from around the world.In addition he has links to some other fascinating sites, mostly concerning birds and especially waders.